Just an update on what I am doing these days, which is mostly studio oriented. My son Michael and I have teamed up to work together on this "Michigan Music" project which, with support from the Library of Congress archives, will document the history of Michigan music from the extensive recordings folklorist Alan Lomax did in Michigan in 1938 on up to the present day and the Earthwork Music Collective that we are connected to and work with. This is the first time that my son Michael and I have had the opportunity to work this intensively together on a common project and I am very enthused. My son Michael, like his dad, is also a still photographer and a videographer, and his day job includes producing music-related videos, so he probably has more hands-on experience in the video production process than I do. This is going to be fun. 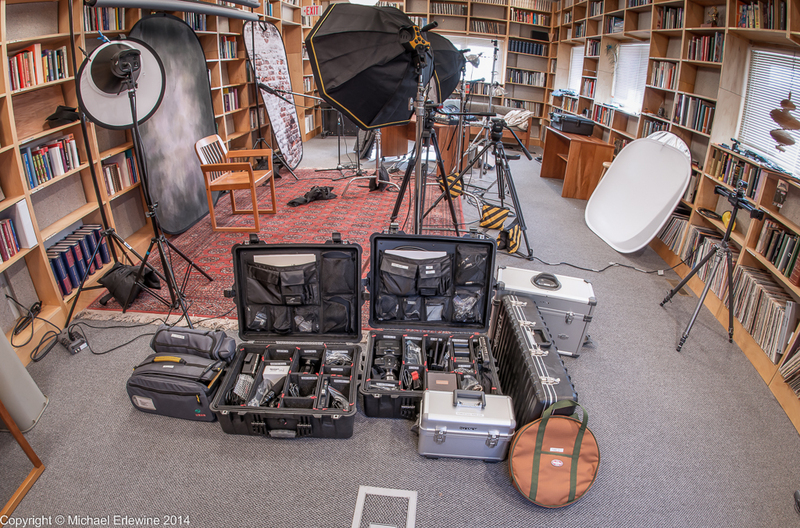 Here is a photo of some of our gear, packed and ready to go out on a location shoot. Video work involves a lot of very detailed connecting of equipment before we can begin to exercise any photographic creativity. Here you can see how much is involved, in a nutshell… or rather in a series of road cases. This studio 'live room', shown here, is 40-feet by 20-feet by 15-feet high, and serves as both a video and an audio recording studio. Looks like a library, but it's not. Every other shelf has books for absorption and diffusion (books are alternately in and out to further diffuse). In between the books are shelves with ecologically-safe acoustic panels that have a better sound rating that Corning Fiberglass panels. This is one of four live rooms, and has 32-audio track inputs and 8 TRS returns. There is also a live drum room with 24 audio inputs, a vocal room, and another large room with keyboards, including a Hammond B-3. In addition, there is an audio control room, a video storage room, plus a break room, a load-in room, and, of course, a bathroom. So, FYI, that is what I have been up to.